I slid my way into work today on sheets of ice due to some recent winter weather hitting us here in Kansas, but I can still tell that spring is near. I just have to go out into the factory to know that it will be here before we know it. We have some exciting projects entering the final assembly stage of production. Here we assemble the rides for testing just before they are shipped to the customer for installation. And then the parks will open to the ride fans eager to see what is new. In fact our shop floor is starting to look a bit like our own amusement park. Take a walk with me below to see some of the projects just about to leave the building. First we have the Freestyle for the The Great Escape up and running. Our team is doing the final program checks before it is sent to the Six Flags park in Lake George, NY. This beautiful ride is going to be called Pandemonium at The Great Escape when it opens for the season this May. 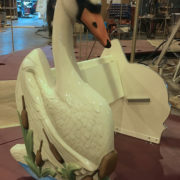 It will leave our factory in a couple of weeks for the installation at the park. The Chance Rides Freestyle spins with seats facing out while the boom rises and turns in the opposite direction. You get an intense experience of G-forces from every direction. You’ll spin into a Pandemonium! Another fan favorite out in the shop is just about ready for shipment, it is our latest Zipper transformation. This Zipper came to us from North American Midway Entertainment. They look forward to debuting the like new Zipper at the Miami-Dade County Fair and Exposition. The refurbished Zipper for N.A.M.E. includes our all new Zipper cage design. It features an open view door and over-the-shoulder restraints. You’ll still experience the same unpredictable spinning action as the cages travel around the spinning frame but now you won’t have to hold yourself in place inside the cage. The thrilling experience will be much more comfortable. The new paint and lighting will be a standout on the carnival midway as well. N.A.M.E. chose a paint scheme of orange, magenta and lime. 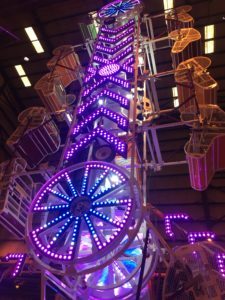 The striking color combination and the new LED lighting will draw crowds from all over the fairgrounds. 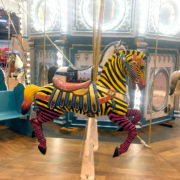 We also have some beautiful carousels being assembled in the factory before they get delivered to their new homes. This 28′ carousel with our Victorian scenery is absolutely stunning. And it is going to feature some very special carousel figures. They will all be a variety of horses and zebras. The most striking figures will be the unusually painted zebras. You can see why they might particularly grab your attention. The carousel is going to our customer in Seoul, Korea. We have had the opportunity to create some very unique works of art for this customer before and clearly this piece is no exception. 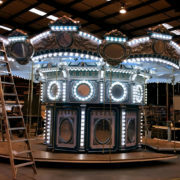 The customer is coming to review the carousel before it is packed up for the journey overseas next month. We also have a carousel for El Paso Zoo in the assembly stage. 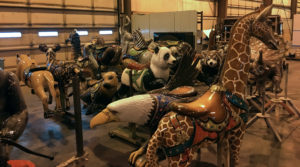 They will be receiving a 36′ carousel with a menagerie of wildlife figures. 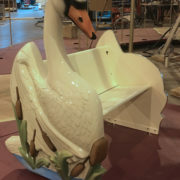 Here you can see the ADA Swan chariot put into place on the carousel. This provides a good seat for grandparents visiting the zoo while children mount their favorite zoo animal. And it allows for those guests in a wheelchair to still experience the fun and beauty of the carousel. The rest of the decorative elements of the carousel are yet to be assembled but here is the beginning of it all coming together. Lately we’ve been spending a lot of time talking about our electric C.P. Huntington model #400 that was produced with zero emission Lithium-Ion batteries, but it would be inappropriate to ignore the beautiful C.P. Huntington model #399 that will be heading out of our facility soon. This traditionally painted train will be going to the Montgomery Parks Department in Maryland. 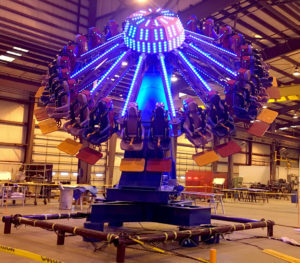 Another big project coming through the factory that is not yet in the final assembly stage is a new family coaster that is going to the new American Dream Mall in New Jersey. The American Dream mall is going to be a world class facility that is beyond anything we’ve ever seen before. The project is being driven by the same people that have brought us the Mall of America and West Edmonton Mall. They have taken the grandeur of these properties and expanded on it. There will be an amusement park, a water park, an observations wheel, an indoor ski slope, an NHL sized ice rink and an aquarium among other features. Chance Rides is very proud to be a part of this spectacular project. 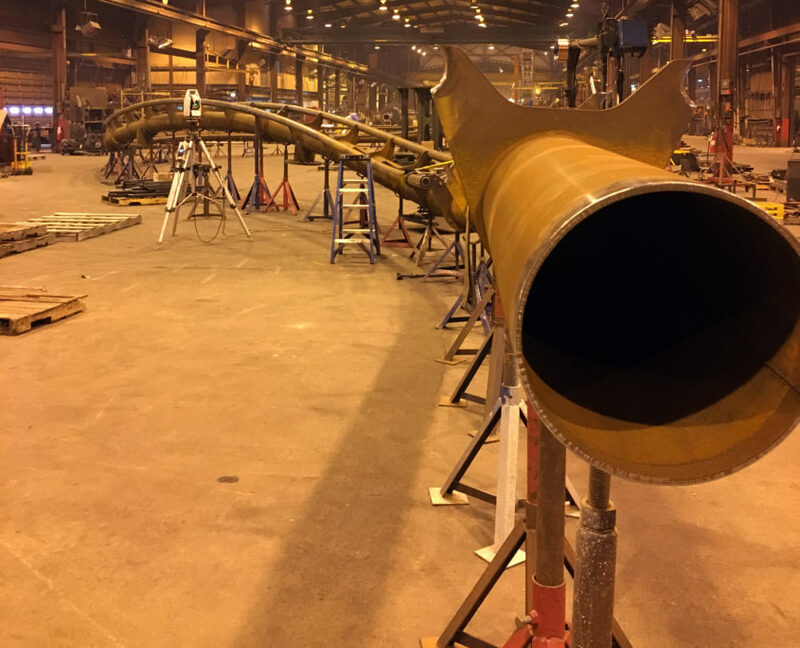 I continue to be fascinated by seeing roller coasters come to life in our factory. They are constructed in meticulously accurate sections that will then be fit together on site. As they work, pieces are assembled together and stretched throughout the factory until they are disassembled, painted and ultimately shipped to the installation site. You can get a sense of the banked turn in these pieces being produced currently. Thank you for taking this walk with me and stay tuned as we see more projects come to life at the hands of our skilled workers.